FIFTY BATTERIES WERE WORKING ON THE WOODS OF BELLEAUCapt. Hyatt, with megaphone, of Battery F, 15th F. A. 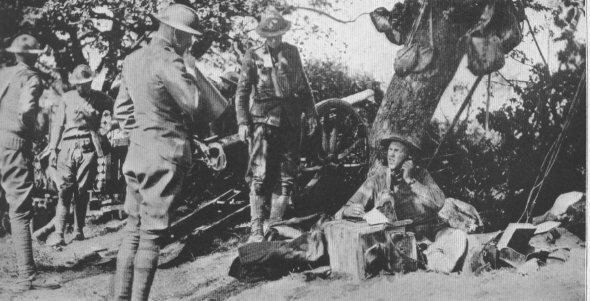 (Light), 2nd Div., receiving reports from observation posts on the effectiveness of his fire. The platoons, very lean now, advanced through the woods filled with shrapnel. 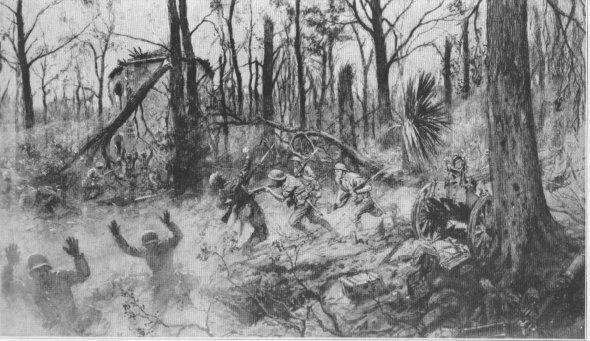 BATTLE-SIGHT--FIRE AT WILLDay and night for nearly a month, they fought in corpse choked underbrush with rifle, bayonet, machine gun and bomb. Belleau Woods, torn by shell, covered with debris of war, was won by inches, the capture being completed on June 26.